Students will be coming back from Christmas break and you want to be ready for them! This blog post will give you eight writing ideas to teach throughout the month of January. I will provide prompts and directions for each of the assignments. You are more than welcome to use these ideas in your classroom without a purchase. If you prefer to simply purchase all the activities already prepared for you at a discounted bundle rate, you can click JANUARY BUNDLE. Keep scrolling for 8 January writing ideas! 8 DIY January Writing Ideas: Let’s start off the New Year with a freebie!!!! 1. NEW YEAR’S RESOLUTIONS AND GOOD FORTUNE BALLOONS. FREE!!! These are so stinkin cute. Click on the picture below to take you directly to this free product! There is a bulletin board sign, balloon template, writing template and 28 good fortunes included. I have students write their New Year’s resolutions in their journal. I then have them pick a good fortune message (already prepared for you) out of a hat and write a prediction in their journal – what their good fortune might mean to them for the new year. After they revise and edit, they will write their final copies on the writing template provided. I also decorate these balloons with ribbon for a cute display! Enjoy this free activity! This cute little fella makes an adorable wall display! On top of that, students will comprehend more of the content when they write about it!!!! 4. 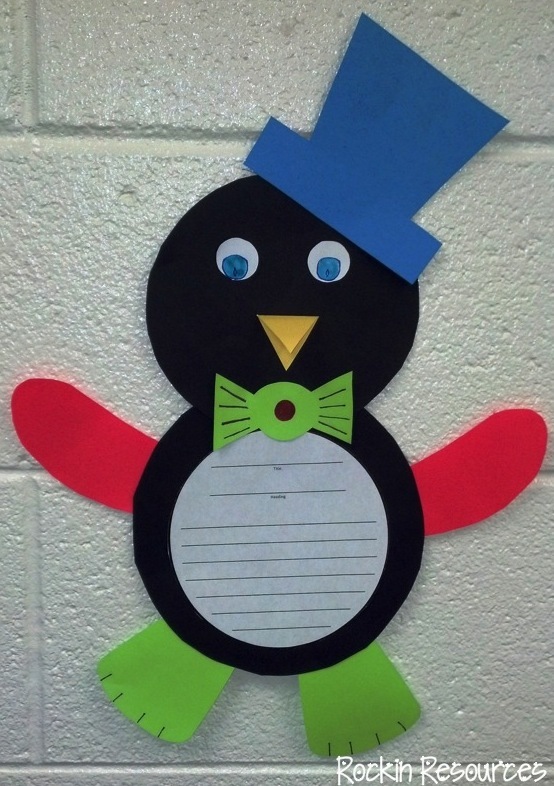 Have other colored paper available for students to create the hat, arms, eyes, nose, bow tie, and feet. 1. Read a nonfiction nonfiction penguin book and/or research penguins on the Internet. 2. Take notes on the information. 3. In your own words, write a final copy onto the smaller circles (try to fill up 3 circles). Use complete sentences and proper capitalization and punctuation. 4. Illustrate a picture on the plain white paper and write a caption. 5. On a lined circle, list four new words that you learned from your reading. Write their definition next to them. 6. 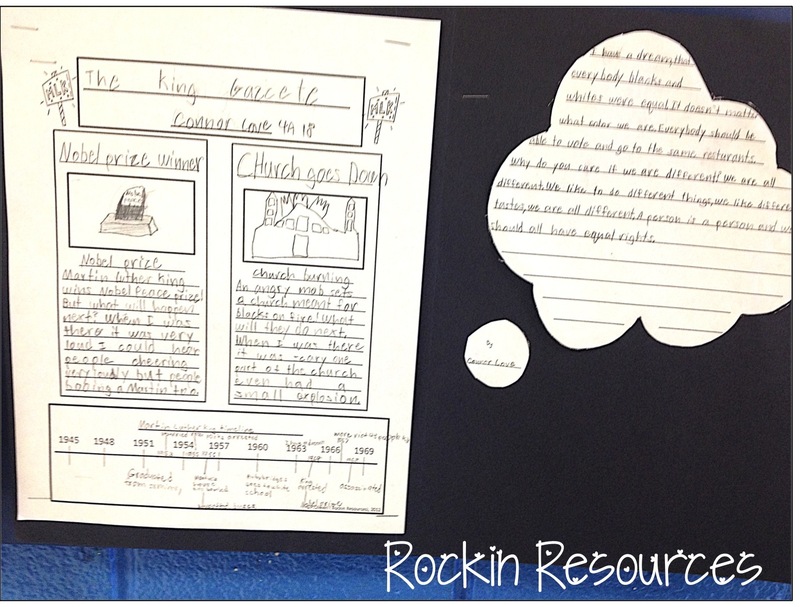 On another lined circle, document the sources used in research. After students write their paper on the circles and create the penguin, then staple the writing onto the belly of the penguin. Cute cute cute! ~Student directions for homework or center. ~Templates for all parts of the penguin. ~Graphic organizer to use when taking notes. This is a fun activity to get those creative brains ticking after break! I love to have students read these out loud to the class when finished! One white sheet of paper per student to cut out a snowflake. One lined sheet of paper to write the final copy. 1. Write a rough draft in your journal. 2. Start with falling from the sky. Tell about where you landed and events of your day. 3. Provide a beginning, middle and end. 4. Use complete sentences and descriptive words. 5. Edit and revise writing. 6. Write final copy on the snowflake template. 1. Fold paper in half diagonally. 2. Fold it again diagonally. You should now have a triangle. 3. Fold it one more time! 4. Hold the point in your hand. Cut along the outside. Some like to curve it like a a pizza slice. 5. Keep holding the point and cut out different shapes on the folds. 6. Open up to see your beautiful snowflake! ~Student directions for centers, homework, or independent writing. ~Directions on how to make a snowflake. How to writing is an important skill for students in the elementary grades. It helps them understand sequencing, steps, and writing nonfiction! The snowman is as cute as can be and it makes an adorable hall display. 1. Cut out three different size circles on white construction paper. (If students need lined paper, glue or staple it to the two large circles. 2. Provide colored paper for hat, scarf, nose and arms. 3. Optional: provide tinsel for the hat. 1. 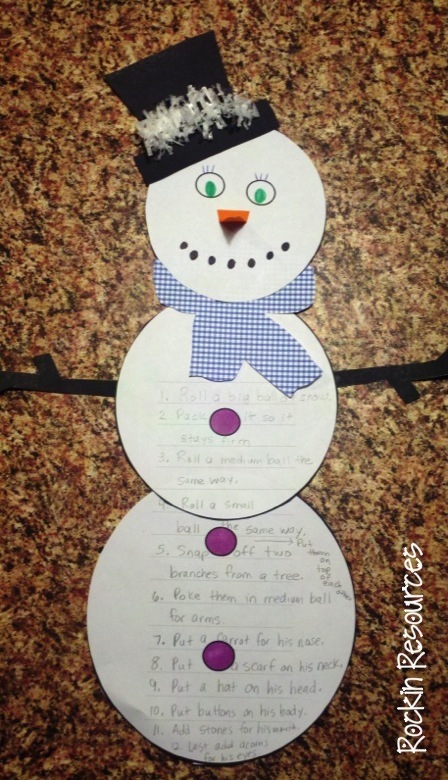 Write a step-by-step rough draft of how to build a real snowman. 6. Copy final steps onto the two larger circles after the snowman is created. 1. Glue the three circles together from smallest to largest. 2. Draw and color eyes, mouth, and buttons. 3. Create arms, nose, hat, and scarf out of colored paper. 4. Glue all the part onto the snowman. 5. Write final copy on the snowman. ~Student directions to set in a center, for homework, or independent work. ~Snowman templates for writing and all other parts of the snowman. 5. JANUARY DIAMANTE POEM- FREE! 1. Show the directions and samples for writing a diamante on a smart board. 2. Brainstorm January antonyms together!!! This will help your students start thinking about their own writing! Using the example on the printable, create your own diamante related to January!!! Nonfiction is important for not only reading, but writing! 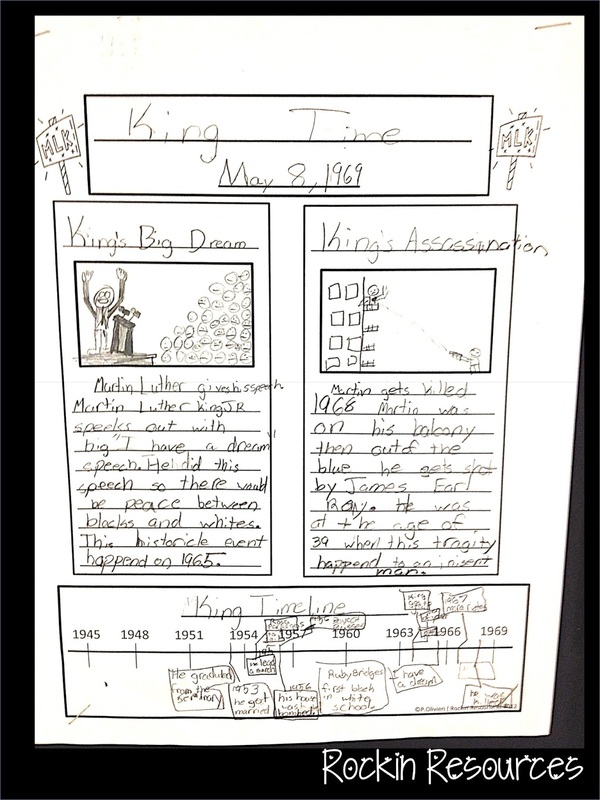 Students can apply the nonfiction elements and create their own newspaper. 1. Find informational text or a book on Martin Luther King Jr.
2. Download and print off a copy of my free Newspaper Article Template. 1. Read about Martin Luther King Jr.
2. Create a newspaper page about events in his life. b. Create a date towards the end of his life. c. Create a headline for a specific event and illustrate it with a caption. d. Write an article including details about the heading. e. Repeat c and d for a new event. ~Martin Luther King Jr. informational text. ~Student directions for centers, homework, or independent work. ~Newspaper template for final copy. If you can find a way to squeeze music in at any time, your students will be so excited! I love the song, Power of a Dream, by Celine Dion. It ties well into Martin Luther King Jr. activities! 2. Develop questions about the lyrics. You are welcome to copy the following for classroom use only! a. Explain the meaning behind the title of the song. b. What is the rhyme scheme in stanza 2? c. Choose a line to illustrate. e. Make a meaningful text-to-world connection. f. What lesson does the song convey? 3. Make a cloud pattern for student writing. 1. Read and listen to the lyrics. 2. Analyze the lyrics by answering the questions above. 3. Reread the line: “Teaching lessons we must learn.” What lesson do you think we need to learn and why? Or what is your dream? 4. Write your final copy on a cloud pattern. 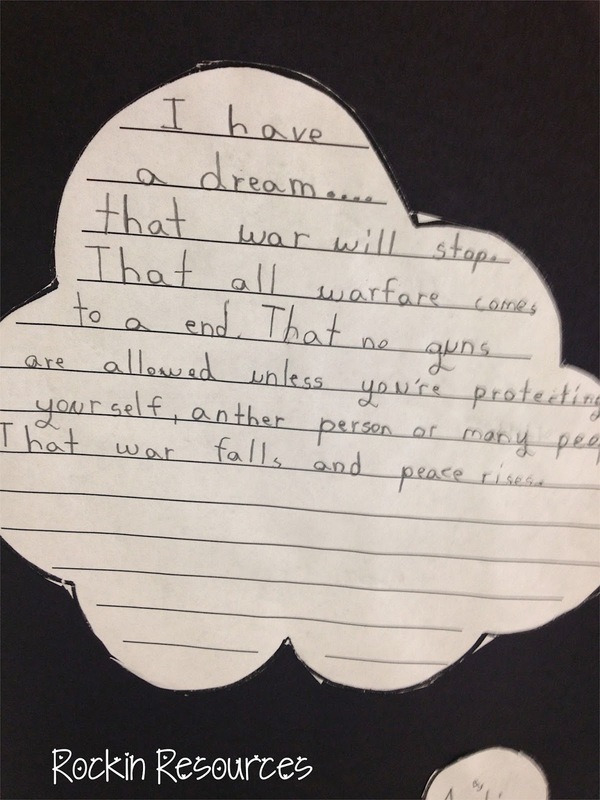 Make a bulletin board with the Newspaper Writing and Power of Dream Writing! 1. Provide writing paper, drawing paper, and construction paper. 2. Download free How to Teach a Friendly Letter. a. Convince the NFL to advertise a commercial about a new phone that you invented. b. Persuade the NFL to sell your favorite homemade snacks at the game. c. Convince the NFL to allow you and your friends to perform a song or dance at half time. d. Persuade the fans for the opposing team to root for your team to win! 2. Write a rough draft. 4. Write a final copy. 6. Staple the final copy on construction paper. 7. Glue illustrations around the paper. ~ Directions for students- great for homework project or centers. ~Friendly letter slides to teach parts of a friendly letter. You are welcome to use all of these writing ideas as a DIY in your classroom. However, you may not sell or post these ideas as your own. All of these NO PREP activities can be purchased at a bundled price. Added to the bundle is a JANUARY WORD LIST perfect for writing assignments!